There’s no better reset button for a show than a season finale. Even for a sitcom, which is largely episodic, the season finale represents an opportunity to shift away from storylines that aren’t working and set the stage for something fresh. Even The Big Bang Theory built an entire season around a wedding and then paid it off with some closure in the finale this year. That kind of storytelling, even if these types of sitcoms don’t really engage in it in the same way something like Black-ish does, is welcome because it provides structure and a sense of time. It’s no secret that Modern Family hasn’t aged all that well. It’s a pretty steep decline in quality from the first four or five seasons to right now, and a lot of that boils down to no structure or sense of time. We should understand where these people are in their lives, and the things they’re worrying about, which enriches the drama and the comedy of each episode. That kind of depth has largely been absent the last few seasons. The eighth season was the worst offender, a collection of episodes that not only struggled to find some comedic spark, but also felt strangely disconnected. This season has been a slight improvement. There haven’t been too many memorable episodes, but the early part of the season had its moments. Plus, it looked like some necessary changes were happening, with Haley getting an adult job and a genius boyfriend, Alex continuing at college, Phil venturing into the unsteady world of magic store entrepreneurship, and Claire’s more prominent role at Pritchett’s Closets. 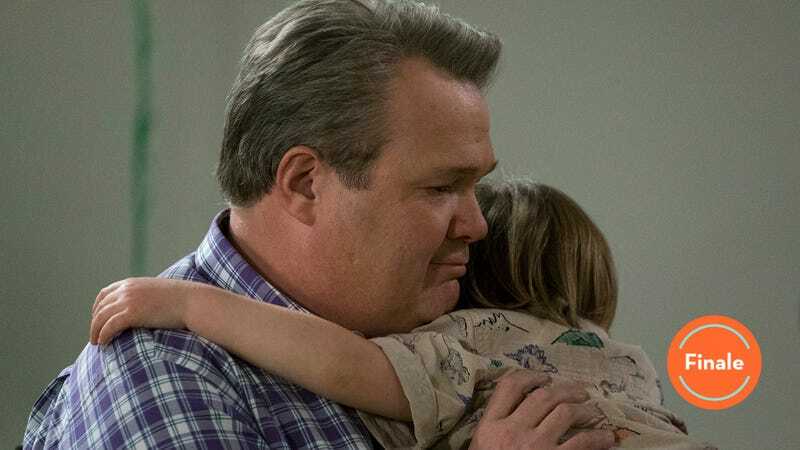 As the season progressed though, Modern Family did little to move these stories along in a meaningful way. That fact makes “Clash Of Swords” all the more baffling. 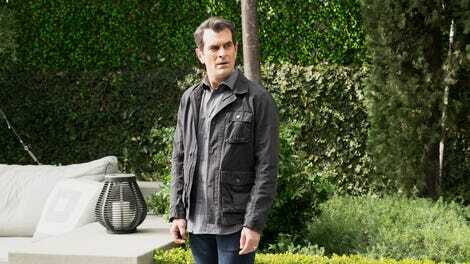 Modern Family is about to enter its final season, which means that the writers must have some sort of endgame in sight. And yet, the season nine finale feels strangely formless. The final scene of the episode certainly sets up some new storylines for the tenth season, but the rest of the episode is like anything else from the last few years. This is a mundane, forgettable episode until its final minutes. Perhaps that’s the essence of the season though, where the larger stories will be forgotten and only a few narrative beats will really linger. Try and think back through this season’s episodes and see if you can pick out the important character moments, or the episodes that made you laugh. There aren’t too many, and “Clash Of Swords” doesn’t suddenly see the show pivoting in a new and interesting direction. In fact, every storyline here is rather trivial. So much of the finale’s runtime is spent on stories that don’t matter in the grand scheme of things, and it’s a disappointing way for the show to close out its penultimate season. The meaninglessness of the episode is evident immediately, as Manny prepares to drive a car across the country, and Gloria kicks off the day of Joe’s big birthday party by completely ruining his hair. At Cam and Mitchell’s house, they’re struggling to deal with the arrival of Cal, Pam’s son, who the two are taking care of while Pam serves some jail time. He’s a big boy, and that means a lot of hugs that end up in tackles. It isn’t long though before Mitchell sneaks off to go to Hero-Con with Phil, where they get to dress up as their favorite characters from the fantasy TV show Clash Of Swords. To say that the storylines progress as expected wouldn’t be completely true, but there’s a complacency here that’s familiar. The conflict in each story simply doesn’t feel like enough for a finale. When Gloria arrives at the hall for her party, she sees that her archenemy, Dr. Donna Duncan (Jane Krakowski, great as always), has booked the room next to hers and thrown a much more elaborate, fun dinosaur-themed party. After Phil helps Mitchell get over his nerves about attending Hero-Con, he ends up being the one embarrassing himself by accidentally revealing spoilers to the gathered fans. For Manny, his conflict is that he’s scared of driving by himself. Now, there is a point to all of these uninspiring setups. The idea, as the episode comes to a close, is that there’s a lot of change coming for these families, and that such change can be scary. Manny has to confront his fear so that he can grow as a person. Mitchell must do the same, finding his place in a community with people who share his passion. It hardly feels like enough though, as if the show knew it wanted to make a point about change, and then sloppily reverse-engineered the storylines. With all of that said, there are bits of “Clash Of Swords” that work. Jay aging out of the closet business has been a long time coming, and it’s encouraging to see the show actual start to explore that process. There’s genuine sadness and confusion in Jay’s visit to EzraVision, the closet company leading the way in smart technology. Similarly, the spontaneous decision from Cam and Mitchell to take care of Cal is promising, potentially shifting the dynamic for next season, and coming on the heels of a season that put those two through a lot. Perhaps the final season can use those slight glimmers of hope to build something better, something that will see the show go out with more than a whimper. “Clash Of Swords” as a whole isn’t that promising though. A Hero-Con all access pass comes with two free yards of mead. The more you know. Sitcoms should probably refrain from trying to do any story related to “nerd” culture because there’s never any actual jokes, just the sense that we should be laughing at grown men in costumes. Which, yes, but still. That’s it for another season of Modern Family reviews. I’ve made through three seasons now. We’ll see if I’m back for a fourth, and final, season.